Billy Graham’s grandson agrees with MLK… kinda. Any time a quote is attributed to Rev. Dr. Martin Luther King, Jr., it demands attention and possibly the breaking out of a handy Moleskin because memorization may help you become a better person. He once was quoted discussing the issues associated with the Church when he said, “11 a.m. Sunday is the most segregated hour in America.” For years, pastors among diverse congregations have either combated or contributed to this axiom for decades. Although some may have no clue this aphorism was ever uttered, it seems one man in Florida with quite the ecumenical legacy not only knows about it, but also is heaven-bent on doing something about it. Tullian Tchividjian is a man with both an incredible anointing on his life, and one huge pair of feet. Why? The shoes this cat has been placed in some massive shoes to fill. Who knew a guy named Tullian could connect these dots? His first pair of wing tips belong to his granddaddy, a gent named Billy Graham? Maybe you have heard of him? I was told he was a big deal. 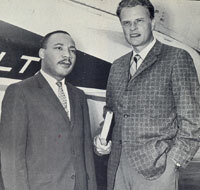 Moreover, Dr. Graham has met the aforementioned Dr. King, so he would know a lot about the hour of segregation. The second pair of Hush Puppies belonged the highly esteemed Dr. D. James Kennedy. A couple of years ago, Dr. Kennedy went home to be with Jesus and left the pulpit of the Coral Ridge Presbyterian Church (CRPC) vacant. After what seemed like American Pastor Idol was complete, the Elder Board called upon young Tullian to pastor the historical church. It wasn’t without creating some cantankerous hullabaloo that needed to happen, but once cooler minds prevailed, the church lowered their old-man pants from midriff and got a little more progressive. And now, thanks to this article in the Christian Post, we see things are even more progressive – and somewhat inspired by Dr. King. CRPC in Fort Lauderdale now offers only one service at 10:15 a.m. with, essentially, blended worship – that means no more separation based on age, likes and comfort. The aim by church leaders, including Senior Pastor Tullian Tchividjian, was to unite the congregation and demonstrate the power of the Gospel. How old is this person? Does it matter? Naturally, there will some compromise between the “Old Rugged Cross” and “For the Cross,” but despite the whimsical guitar riffs and slow melodious chords on the pipe organ, the object is getting everyone to the Cross. Yes, Dr. King was clearly discussing race, but Pastor Tullian took another demographic clearly segregated more seriously and decided that wall needed to come tumbling down. Man, preach that. Saints, we need to learn because this decision – as bold as it was – reflects the microcosm that exists inside the entire Church, not just his. Go to any church or watch TBN for any period of time and you will easily see we are not a “Catholic” church. There is nothing universal inside of it. Country clubs have strict rules about keeping out the riff raff. Why? Because they can. The only difference with churches is that there are no printed signs in the parking lot. This may seem like a stretch to make an ideological statement out of removing the Gomer worship service, but there is validity in it. Churches should dig internally and discover ways to unify their congregations in every way possible. And if that means worship leaders can mix in a classic hymn with an upbeat twist versus some random David Crowder tune no one outside of folk with the CD has heard, then so be it. If you don’t believe, check out the guy who sounds like he is channeling Grandpa. Yeah, the next time I am in Fort Lauderdale, I am so checking out this worship service. I’m sure the pastor isn’t that shabby either. Elvis and Jesus: Long live the Kings? Giving at church has been about as flat as, well… attendance in church since the bottom dropped on the national economy. 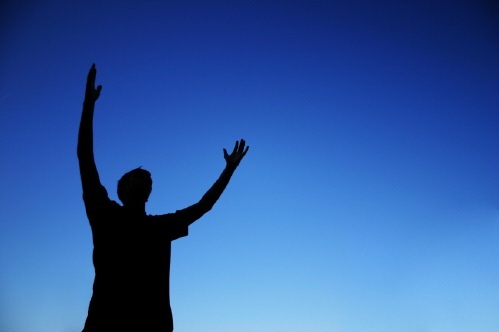 However, when God is alive in your heart, quit is nothing more than a dirty four-letter word. Just ask Archbishop Dorian Baxter who holds church services in a Royal Canadian Legion Hall as a notable Rock and Roll singer. (Shout out to another brick on the Wall, Bene D the Canuck). Baxter knew the secret to driving attendance into his hallowed halls – a certified gimmick. And he found one in the most obvious of places – his mirror. It seems this raven-coiffed, seemingly half-baked son of the 60s shares an obtuse and no-way-close resemblance to a young man named Elvis. At least that’s what his friends say, but who am I to argue? I’m sure he gets slammed enough with that shingling he’s rocking around his ears. Church is free and I would pay money to see that tomfoolery. Evidently, the Elvis dedication hour got him in hot holy water with the Bishopric as Baxter was removed from his original parish in 1998. I know what some of you cynical Wall Watchers are thinking, “At least he has a career in Vegas at the local chapel.” Not according to the Anglican parish, he was stripped of his right to perform marriages. How daftly ironic is that?! 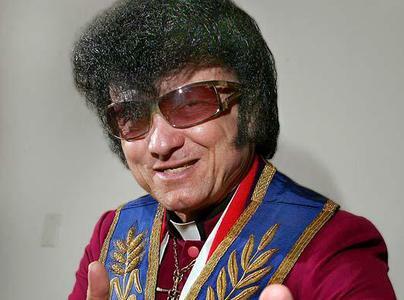 Despite the irony and impersonations, Baxter forged ahead glorifying God while sporting his mutton chops and pompadour when he formed the – wait for it – Christ the King, Graceland Independent Anglican Church in 2003. Obviously, someone is being more than amused by this stage show – it’s more of a blessing. Baxter is exalting God by toasting a peanut butter and banana sammich. Who would have thunk it? Baxter’s church sponsors a breakfast program, Christmas hampers and 92 orphans. He said he thinks Elvis would have liked that. He’s also made peace with the main body of the Anglican Church, but has rejected offers to rejoin it. Ah well, God’s word never returns unto him void, we read in Isaiah 55:11. Or would that be “Return to Sender,” I can’t remember. Cross Eyed: The Last Supper Cubed? In the screaming 80s, teeming with toxic hair and cross-dressing rockers, Styx penned a song, “Too much time on my hands (tick, tick, ticking away).” Aside from Dennis DeYoung’s chops leading the couch potato’s hymn, I never really cared for the song… until now. This week in video evangelism, we have the work of what has to be some 50-year-old from Toronto (shout out to Bene D) tool sparing life away in the basement of his mama’s house while meticulously caring for his Star Wars collection. As you can see, the artwork is imbued by the Rubik’s Cube. 4,000 of them to be exact. Sigh. Stay tuned for the Mona Lisa done in butter. Yummy! God Sighting of the Month: Holy crap? This month in the mad dash around the world for the face of God, we find ourselves in Scotland (Shout out to Bene D). Glascow, to be exact, where God was not only seen… but looking back at his creation in the most vile of acts. Now I realize God is omnipotent and omnipresent, so hiding from the Spirit of God while in the club, at that certain someone’s house or erstwhile gallivanting in sin is ridiculous. Courtesy: John Gunion, "The Sun"
However, there is one place I wish God didn’t see me (and forgive the candor, but tagging on this Wall is about being real). That’s right, the dreaded Number 2. Amen, somebody? I mean, while you are blue-knuckling it and playing a nice game of Tetris on your iPhone is not where you want to see the Almighty staring back at you. Nonetheless, there he is, catching a bathroom glare at the neighborhood IKEA according to WOW News’ The Telegraph (UK). There is some debate over whether the face truly represents the Son of Man, or whether it is in fact Gandalf out of the Lord of the Rings, or even a member of ABBA. Now whether this mug shot was a wise old warlock, a beatnik 80s roller skate band member or even the Shroud of Turin, the last place I need to see a pictograph within three inches of my face is while I am dropping a deuce.